Just think of your special person opening this gift. Think of all the emotion, gratitude and a bursting desire to get stuck in that flood through their mind when they receive this wonderful surprise on their special day. Let’s unwrap it and see what treasures are hidden within. 1 box of Milk Carrés. 100gr. 1 box of White Carrés. 100 gr. A superior palate knows what it wants and demands only quality and mastery. Godiva and Moët Chandon are two masters in their art as chocolatiers and champagne producers, respectively. 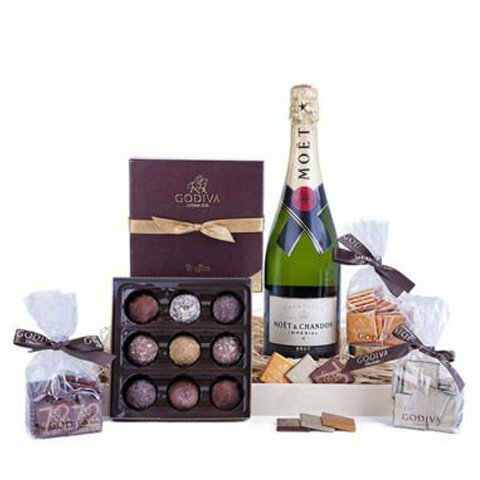 This is why this basket is particularly selective and combines chocolates and champagne that are simply perfect.